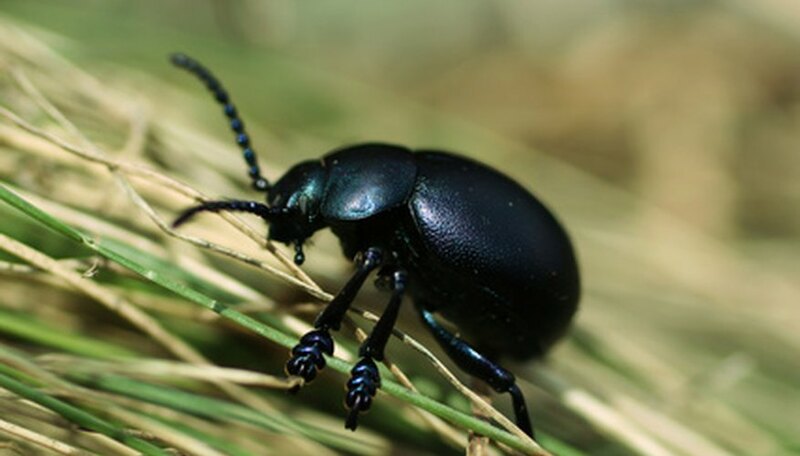 Big, black beetles can refer to a wide range of beetles, but the most common household beetle is the black carpet beetle. These beetles, which are attracted to light as well as to flowers, often enter a home in the spring and lay their eggs around baseboards, in linen cupboards (especially if woolen items are present) or in stored cereals or dried pet food. It should be noted that the adult black beetle itself is not much of a household menace; it is the larva of the beetle that does the most damage around the home. Find the source of infestation. Often the beetles are concentrated in a particular area, one where there is wool or leather (which they eat) or where it is damp, or where cereals or dried pet food are stored. They can also live in the dust along baseboards and inside of walls. Remove the material that has attracted them if a source of infestation can be found. Remove woolen and leather items, and throw out stored cereal or dried pet foods that have become infected. Wash any clothing that may be infected in hot soapy water. Learn to recognize the black beetle's larva. The larvae, which look like stubby worms, can be as long as half an inch, somewhat carrot-shaped and can be golden to chocolate brown in color. They also have a distinctive tuft of hair at their tail ends. A typical clutch of eggs consists of approximately 50. Dispose of as many of the larva as you can. Shake household grade diatomaceous earth onto the larva and into areas where larva are likely to be growing (such as holes in baseboards and other dark and hard-to-reach places). Keep in mind that diatomaceous earth (which cuts the larva's body and causes it to dry out) must be totally dry in order to work. Allow up to five days for the diatomaceous earth to work. Spray an insecticide that is formulated to kill black beetles and black beetle larva. Read the label and follow all directions carefully. This step should only be taken if the diatomaceous earth fails to work as insecticides can be harmful to pets and children. Keep screens closed in the spring to prevent black beetles from entering your home. Keep dead vegetation away from the home (since dead vegetation attracts the beetles) and keep porch lights off as these also attract the beetles. Household grade diatomaceous earth is not harmful to pets and children, although children should not be encouraged to breathe the dust or get it in their eyes. Boric acid may be used in place of diatomaceous earth. It is also not harmful to pets and children.